Is your Kitchen looking tired and outdated? 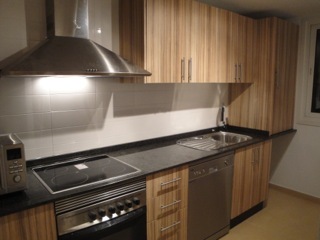 Want to create your dream new fitted kitchen in Murcia Spain? ABS Services supply and professionally install new kitchens to fit all shapes, styles and budgets in the Costa Calida Murcia and Mar Menor regions of Spain. Choose from a wide range of new fitted kitchens and allow our design, planning and installation services to take the stress out of creating your new fitted kitchen. From base units, wall cupboards, worktops including granite, taps and appliances, ABS Services can supply and install everything you need, including the kitchen sink! Create a slick new fitted kitchen in Murcia with a design to maximise all your available space. Fitted kitchens with built-in appliances provide a stylish space saving solution and ample storage for all those pots and pans! For those with a little more floor space why not consider installing a kitchen island that will offer an attractive focal point and also provide the additional benefit of extra built-in cupboard space. ABS Services can also undertake electrical alterations, plumbing, wall and floor tiling, decoration and any other building works that may be required in order to create your new dream kitchen in Murcia Spain. Whether you’re fitting out your entire kitchen or just looking to make just a few alterations, look no further to contact ABS Services to efficiently and professionally carry out this work. ABS Services supply and professionally install new fitted kitchens and granite worktops to Polaris World Golf Resorts at La Torre, Mar Menor, Hacienda Riquelme, Terrazas de la Torre, Condado de Alhama and El Valle. Surrounding locations also covered at Roda Golf, Club La Manga and La Manga strip, Costa Calida, Mar Menor, Los Alcazares and Murcia Spain.